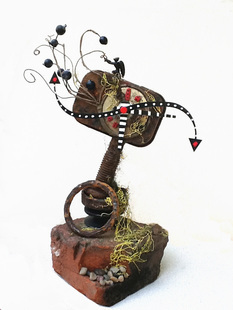 Jacqueléne Ambrose's fascination for unusual clocks led her to created this on-going expression of her creative imagination. Clock Artistry Art Clocks are featured in Galleries and Specialty shops. Each hand-made piece uses a variety of re-purposed objects; rusted metals, stones, varieties of Liken, offerings from nature and random found objects that blend together in many unexpected ways. The clock housing often uses mint tins, tuna cans and other recycled materials that hold the Quartz movement mechanisms.